Agnes Ethel was born circa 1845 in New York. Agnes Ethel appeared in the US federal census of 1 June 1870 in New York, New York County, New York, at 248 48th Street between 7th & 8th Avenue her age recorded as 22, living in the household of Lorenzo and Rose Roderbush. She married Francis Walsingham Tracy, son of Albert Haller Tracy and Harriet Foote Norton, circa October 1873. The following appeared on 23 October 1873 in The Daily Critic: Agnes Ethel has married Francis W. Tracy, a Buffalo merchant, and left the stage. The following appeared on 26 May 1886 in The Macon Telegraph: In the New York World of Sunday is found a statement that Agnes Ethel, the well known actress, is made wealthy by her husband's death. Her husband was Francis W. Tracy, was a nephew of Judge Edward D. Tracey, who lived in Macon. Major Phil Tracey, son of Judge Tracey, was about the same age of Francis, Jr., and they were very fond of each other. When the Major was killed at Sharpsbury, during the war, he went after the body and had it buried in New York, where it still reposes. Because of his friendship and relationship, the surviving members of the Tracey family in Macon were so handsomely remembered. "Agnes Ethel, who created such a sensation on the American stage some years ago, and who has since lived in retirement, is, by the will of her late husband, Francis W. Tracy, left a millionairess. Mr. Tracy died at his residence in Buffalo on April 21, leaving a fortune of about $3,000,000. His nearest relatives were his widow and Miss Harriett F. Tracy, a daughter by his first wife. "From the complications in the Tracy family history there has been a great deal of curiosity manifested as to the probable distribution of the estate, but until Friday the contents of the will were kept secret. Then it was filed for probate with the surrogate of Erie County, and the hearing was set down for the 28th inst. The body of the will is in itself a formidable document, and there is attached to it a small army of codicils. "To his widow, Agnes Ethel Tracy, the deceased gives the handsome dwelling house at Franklin and Court streets, Buffalo, and the furniture, pictures and plate contained therein; also the horses, carriages and other articles of personal property about the premises. Further than this he bequeaths to her one-half of all the residue of his property, both real and personal. Next in order the will mentions the daughter, and in a way, it is said, which displeases her to such an extent that she intends to contest the will. To her he leaves in the hands of the executrix and executors, as trustees, $100,000, to be invested in first-class securities and applied to her use as long as she lives. In case of her death it is provided that the principal then remaining shall go to her issue, if she have any living, and if there be no issue the amount is to be considered as a part of the residuary estate. In explanation of the small amount left to his daughter, Mr. Tracy says in the will: 'I have limited this bequest in her favor for the reason that her mother is possessed of an ample fortune.' In a codicil to the will the daughter's bequest is slightly changed, it being provided that from the $100,000 held in trust she shall be paid an income not exceeding $3,000 for maintenance and education till she be twenty-one years of age, and that thereafter the entire income, interest and profits shall be applied to her while life lasts. "Among the remaining private bequests are the following: To William Shelton the income of $40,000 so long as he lives; to Anna Tracy Johnston and Harriet Tracy, daughters of Edward D. Tracy, his uncle, each $30,009; to the two daughters of his cousin, Edward D. Tracy, late of Macon, Ga., $15,000 each, and to Tracy Baxter, of Macon, Ga., $15,000." "Agnes Ethel was once a poor sewing-girl, and was employed by Matilda Heron, the famous emotional actress and the mother of Bijou Heron. Recognizing the girl's fitness for the stage, Mrs. Heron brought her out in a small part. Her first great success was under Augustin Daly at the Fifth Avenue Theatre, in the emotional line represented by 'Frou-Frou.' She was leading lady in the part, with Clara Morris supporting her. Later she went to Europe and had her own play, 'Agnes,' written for her by Victoria Sardou. This is the play of which 'In Spite of All,' played lately by Miss Minnie Maddern, and 'Anselma,' in which Mme. Janish played recently, are adaptations. In this play, Miss Ethel reached the height of her success, and it was then that Mr. Tracy fell in love with her. She is said to have returned his affection, and they were married after a brief courtship, Mr. Tracy making the sole condition of the alliance that his wife should leave the stage. To this she consented, and during the dozen or more years which have since elapsed she has never appeared before the public except in occasional amateur performances." The following appeared on 30 May 1886 in The Cleveland Plain Dealer: Agnes Ethel, who created such a sensation on the American stage some years ago, and who has since lived in retirement, is, by the will of her late husband, Francis W. Tracy, left a millionairess. Mr. Tracy died at his residence in Buffalo on April 21 [sic], leaving a fortune of about $3,000,000. His nearest relatives were his widow and Miss Harriet F. Tracy, a daughter by his first wife. In 1890 she married Clive Roudenbush, and obtained a divorce from him in 1901. 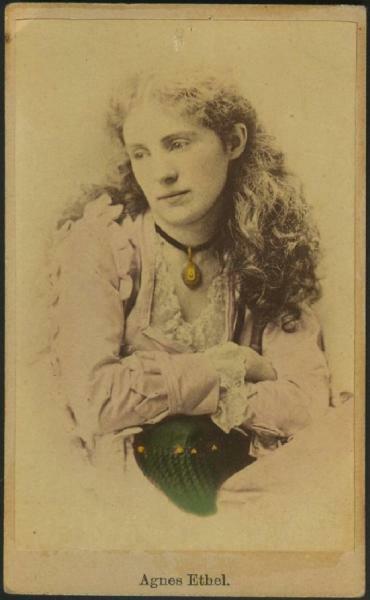 Agnes Ethel died on 26 May 1903 in New York City, New York. She was interred at Forest Lawn Cemetery, Buffalo, Erie County, New York.